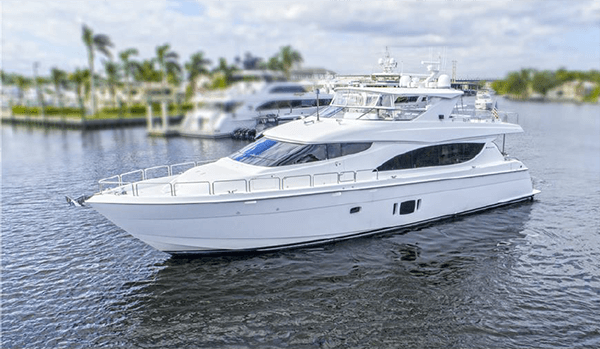 80 Hatteras Motor Yacht for Sale "Tireless"
Tireless is a beautiful one owner 80' Hatteras featuring African Mahogany interior wood with high gloss finish- only part of her upgraded décor package. Custom touches include the sunken wet bar in the Salon, and custom crystal, glassware and china cabinets. A Macassar Ebony dining table and storage chest stand out, ready for family or entertaining. The Master Stateroom features a walk-around king berth with storage underneath. The his and hers head arrangement and twin cedar-lined hanging closets are in addition to port and starboard storage drawers, beautifully lit by custom port and starboard portholes. The Tireless galley includes granite flooring with keystone tiles, a Sub-Zero refrigerator/freezer, and a KitchenAid cooktop. Ample counter space and an L-shaped dinetter with seating for five create an open and inviting space. Additional custom and upgrade touches include: electric salon door, underwater lighting, LED lighting throughout, tinted salon and galley windows, hot tub, docking station, and a Brownies Dive Compressor. Each stateroom has its own safe. Contact Ed anytime in the Ft. Lauderdale office for more information. His cellular phone number is (954)-646-1609 or email ed@qualityyachtsforsale.com.